Alarm and Status Monitoring: Video motion detection alarm will activate the video popup, audible alarm and alarms logs. The alarm and status event includes video loss, harddisk failure, devices failure, alarm sensors, harddisk full, etc. Video clips can be searched with date and time index or event occurrences; and operated with play, pause, stop, fast forward and fast rewind functions in a user-friendly interface. Users may easily export selected period of video clips into one AVI file format. Create snapshot images on-the-fly and as an event index for search later on and support the bi-directional voice dialogue with video server. 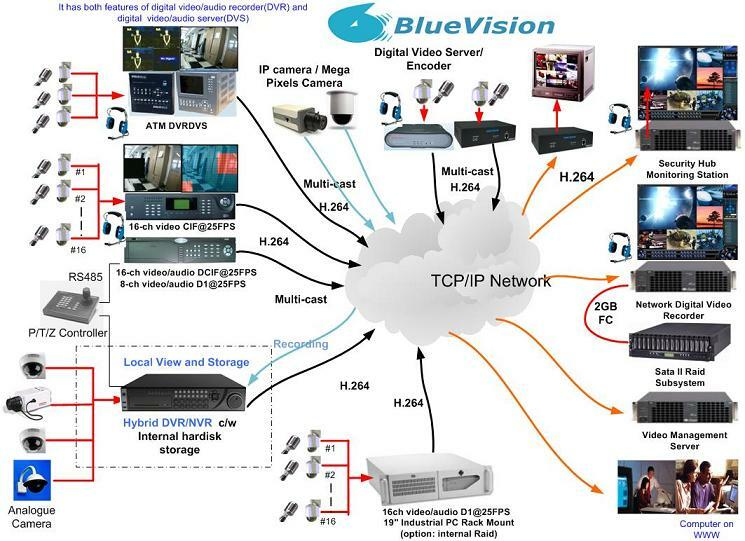 1ch to 16 ch real-time video recording at 25/30 fps per channel supporting CIF, 2CIF, HD1 and 4CIF. Built-in motion detection and privacy masking. Recording and play back can be done at local and remote site. Voice communication and Alarms with surveillance center can be done through network.